We wanted an easy way to see the accelerometer data from the USB POV Toy. 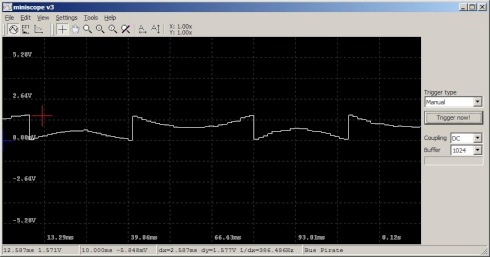 We made a simple firmware that works with the miniscope v3 oscilloscope program. Instead of sending voltage readings, it sends the accelerometer data from one axis. This screenshot shows the change in readings while we wave the POV Toy back and forth. The accelerometer has a mode that generates an interrupt when a threshold measurement is reached. If we reset the POV drawing each on each interrupt is should be possible to sync with the waving speed using minimal power. Follow our testing and progress in the development thread. This entry was posted on Wednesday, November 3rd, 2010 at 3:42 pm	and is filed under Development, POV Toy. You can follow any responses to this entry through the RSS 2.0 feed. You can skip to the end and leave a response. Pinging is currently not allowed.